the exhibition “so sorry” can be considered a “work in progress”. our teams are constantly updating the rooms, adding new items such as materials and print, which relate to ai weiwei’s architectural projects, his recent exhibitions, “soft ground” as the central piece of our exhibition, the edition “dust to dust” especially created for the haus der kunst, etc. recently we (re)discovered important ideas and new explanations, some related to the important exhibition and the accompanying splendid exhibition catalogue “holzkonstruktionen” at the pinakothek der moderne. 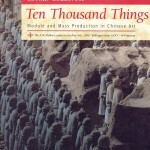 for instance, internationally renowned scholar of chinese art lothar ledderose – who did also attend the opening at the pinakothek – writes in “ten thousand things, module and mass production in chinese art”: “it is sometimes said that the most beautiful neolithic pots in the world are found in china. that they are also the most numerous comes as no surprise”. much applies also to ai weiwei’s editioned container “dust to dust” that holds plenty of neolithic materials indeed. ledderose shows in his book that modular systems run through chinese traditions, techniques and ideas, through chinese religion and even the organisation of chinese restaurants for many centuries. ledderose and other scholars such as of course francois julien – whose rich essays on “the other china” are available in german, too, help us to understand chinese aesthetics in a new way, relevant for today and therefore for the art of ai weiwei as well. his books sell at walther koenig’s bookshop like hot cakes. the same goes for recent books on chinese politics and social organisation by rebel-authors mark leonard and ian buruma. a very good introduction to ai weiwei’s artistic and social concerns is delivered in “kontroverse über china” with contributions by, amongst others, dirk baecker, wolfgang kubin and again francois julien. 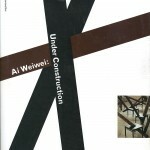 probably the best book written so far on ai weiwei’s art itself is entitled “under construction” by art historian charles merewether. 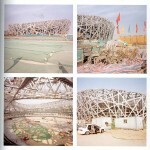 and one should definitely not forget another essential ai weiwei book, namely “nudeln für das volk” by jen lin-liu. finally, we are very curious to read werner spies’s reflections on his favorite ai weiwei-piece “soft ground”, as Spies described recently to us ai weiwei’s enormous carpet holding century-old tree-trunks, as a truly new interpretation of marcel duchamp’s ideas about the “infra-thin”. we will be happily adding his statement as well into our exhibition rooms. warum entschloss sich buddha 1000 jahre nach seiner erleuchtung gartenmöbel zu bauen?